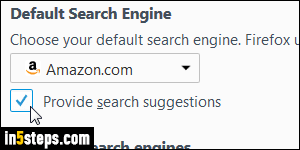 Out-of-the-box, Firefox can search the web with one of eight search engines: Yahoo, Google, Bing, Amazon, DuckDuckGo, eBay, Twitter, and Wikipedia. If that weren't enough, you can even add search engines to Firefox! 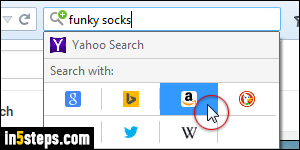 To launch a web search using a different provider, click on the magnifying glass icon, pick it in the dropdown, type your query, and hit Enter. 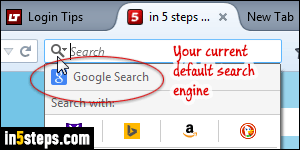 This doesn't change your default search, but it lets you use a different search engine as needed. 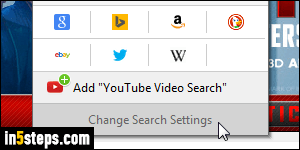 To actually change your default search engine, the one that's automatically selected for new tabs and whenever you restart Firefox, click on the magnifying glass again, but this time, select "Change Search Settings" at the bottom. This will open a new tab ("about:preferences#search"), which starts with a "Default Search Engine" dropdown. The search engine visible before you click is your current default. 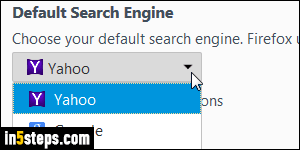 Nowadays, Yahoo is the default search provider in Firefox, since Google stopped sponsoring the open-source web browser (with Chrome, Google now sees Mozilla as a competitor). Pick a different search engine from the dropdown to change your default: there is no need to save - just change your setting and close that tab, everything is automatically saved. To check your current default, just click on the magnifying glass and see what search engine is listed first - that's your default. An extra tip: right below the Default Search Engine dropdown is a checkbox that reads "Provide search suggestions". If the feature is available to that particular search engine, and if the checkbox is checked, the search engine will show you real-time suggestions as you type your queries. Just like the auto-complete feature you get when being on the search engine page itself!